The portable and convenient tea set not only allows us to enjoy the happiness from drinking tea, but also spread the fun of modern tea ceremony. This tea set is a combination of glass and ceramics, carrying the fashion of glass and the thickness of ceramics at the same time. It’s consists of three parts, a glass lid, a ceramic inner and a glass pot. There are glass handles on both sides of the body, which can block the heat and prevent the fingers from being scalded. In addition, the bottom of the inner is double-filtered to make the tea soup more pure. The surface of the inner and cups are coated with sacrificial blue glaze, also named deep blue glaze by high-temperature. 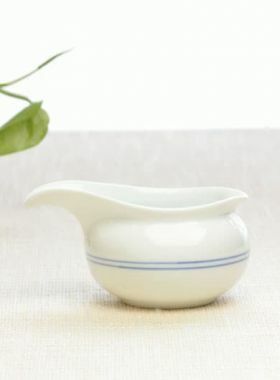 Sacrificial blue glaze is used to describe the color of porcelain and usually applied to the traditional Chinese porcelain crafting process to give the porcelain an uniform blue color like deep sea. The surface of the porcelain also outlines a few ginkgo leaves as decoration, making the whole tea set more elegant and artistic. 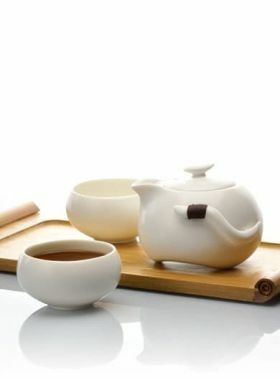 Whether you are brewing black tea, Pu-erh or other types of tea, this tea set is a good choice for daily drinking both at home and in the office. The inner and cups have shiny and smooth appearance with clear Kai Pian (tiny cracks) on the surface, please note it’s a normal phenomenon. 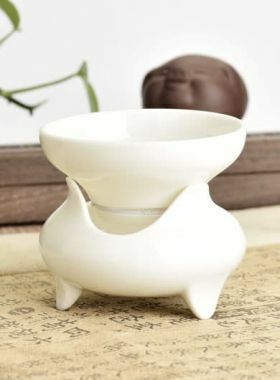 With long time use, the tea liquid will gradually penetrate into the cracks, and forms different lines on the teaware. The deeper the lines, the more charming the teapot will be. The inverted glass lid is a natural inner base, making the brewing process clean and hygienic.